« Listen To Your Bubby! If you want to have a proper party for International Talk Like a Pirate Day, you should invite some pirates. Like Captain Morgan, for instance. Okay, so perhaps he is the fictitious product of an Ad-man’s imagination. But he is a real enough character in modern culture, that grown men can actually earn a living making public appearances dressed as the Buccaneer of Booze. 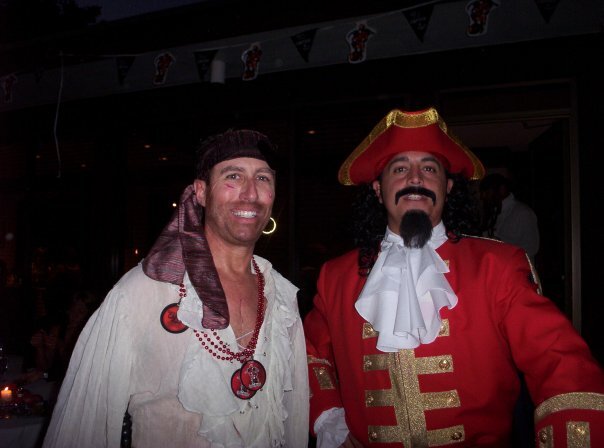 DJ Scott with Captain Morgan, a wanna-be pirate, who is actually a paid model. His contract requires him to pose with his left leg raised for all pictures, to look like the logo picture. However, without a barrel to rest his foot on, he looks more like a dog at a fire hydrant. Yes, if you contact the right people at the liquor distributor’s office, they will send Captain Morgan, or a reasonable facsimile, to your party. They will even go you one better: they will send his crew of Morganettes, models dressed as pirate wenches, to distribute free samples of Captain Morgan’s Rum products. The Captain with some Morganettes. Note the raised leg. This entry was posted on December 23, 2009 at 12:01 am and is filed under Pirate Holiday, Weird Things at Parties. You can follow any responses to this entry through the RSS 2.0 feed. You can leave a response, or trackback from your own site.